Including Baskin Robbins, Bob Evans, White Castle, and more. Free $25 Restaurant.com gift certificate: With a $25 purchase at Drugstore.com [1/13]. Shipping is free too. Baskin Robbins: Free cup or cone of the flavor of the month – berry passionate frozen yogurt – with the purchase of a cone or cup (print first) [1/5]. Bob Evans Restaurant: Free breakfast entree with the purchase of an entree (print first) [1/12]. Buca di Beppo Italian Restaurant: $10 off the purchase of two entrees (print first) [1/13]. Marie Callender’s Restaurant & Bakery: 50 percent off one entree with the purchase of two total entrees and drinks (print first) [2/1]. 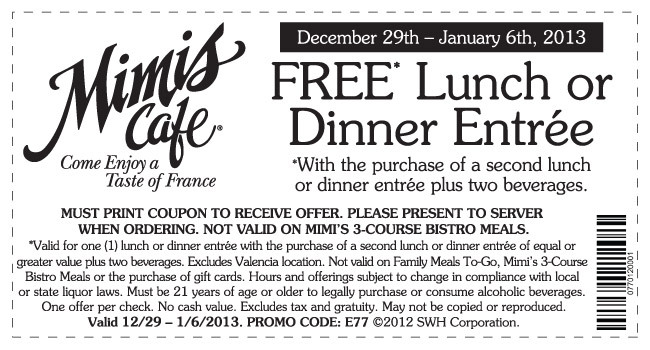 Mimi’s Cafe: Free lunch or dinner entree with the purchase of one entree and two drinks (print first) [1/6]. Olive Garden Italian Restaurant: The “2 for $25 Italian Dinner” deal includes two entrees and an appetizer or dessert [1/20]. This deal isn’t brand-new but does end soon. White Castle: $3 off a Crave Case of any 30 sliders (print first) [1/12]. Fresh & Easy Neighborhood Market: $3 off a $30 purchase (print first) [1/8]. Coffee: $1.50 off Gevalia (“like” and print first) [expiration unknown].